Chrome OS allows others to use your device to browse the internet without keeping their browsing history. If you have children, this may be a concern for you. Here’s how to disable guest browsing. 3. 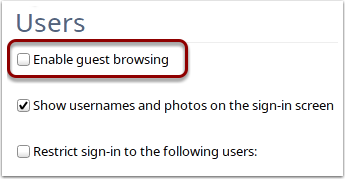 In the right pane, uncheck the Enable guest browsing checkbox. Bonus tip: You can also access the Settings – Users page by typing chrome://settings/accounts into the address bar and pressing ENTER on your keyboard.